I was looking forward to the Speciality & Fine Food Fair at Olympia in London this week, but didn’t expect to be so rushed off my feet! I met so many lovely people, small and large producers, and tasted some interesting products. Among these was a popcorn by Ten Acre, a company usually known for its crisps. This popcorn was fennel and lemon flavoured, which took me right back to an Italian restaurant in New York and the amazing sausage I quite regularly enjoy when I go there. It was a fantastic flavour experience, void of any chemical aftertaste and overbearing personality. I loved it and only regret not taking a bag home. I also had a chat with Simon Bell from Donatantonio, who was launching 16 products in the Lupetta range of Italian ingredients. I didn’t want to miss out on the Chocolate Fair, so wandered around taking photos and meeting lots of confectionery entrepreneurs, and even managed to catch the giant chocolate saxophone. Jean-Marie Dessard and Philippe Wall were responsible for bringing the 10ft tall chocolate saxophone to launch the exhibition, and it really is quite eye-catching. Finally (for now), here are a few photos from the event, with some from my colleague Claire Phoenix. The show’s organiser tells me that there have been a record number of exhibitor re-bookings for the 2015 Fair, which just goes to show how popular, vibrant and important this show is. 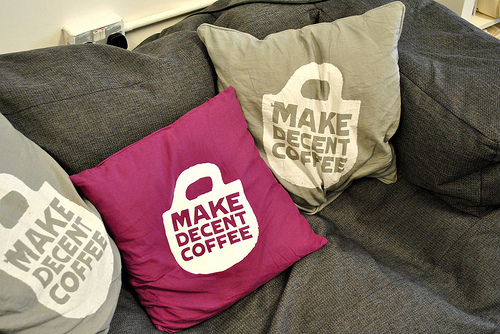 Will brand giants such as Starbucks capitalise on ‘independent’ thinking? I was talking about customer demographic yesterday, and about how McDonald’s (in the UK, at least) has managed to capitalise on a broad cross-section of society more than any other outlet I could think of. I used Starbucks as an example of a global company that doesn’t seem to have managed the same feat, and perhaps it’s all for the better. When I go to the US, most of the Starbucks branches I come across are generally untidy places that could use some TLC, and they’re often set up ‘to go’ rather than to sit and relax and let the pressures of the day unfold around a short cappuccino. In the UK, Starbucks feels different. The branches seem to be larger and take into account a number of factors, such as a section for getting in and out quickly, plus a large room (sometimes two or three rooms) with various seating options for comfort and laptop use. You could argue that the Starbucks demographic, which I officially know very little about, is quite different when it comes to the UK and the US, yet the clientele can often seem similar: business types in sharp suits, students with friends, couples, middle class families, and trendy hipsters looking for a place to chill out or work. You don’t often see children, which you’re more likely to see at McDonald’s. Espressamente illy at Park Plaza Westminster Bridge in London. Costa Coffee is going through subtle changes at the moment, seemingly in an attempt to break the mould that’s been unashamedly copied by many other coffee shops (chain or independent). You can walk down any major high street in the UK and see identikit coffee shops that reveal a lack of originality, yet this perhaps plays safely into the hands of a certain coffee-consuming demographic. Some independent coffee shops are trying a few different things, such as Mokoko in Bath, which is small (no inside seating) and only two or three tables outside. It’s set up for ‘to go’ coffee, yet still serves its sit-down customers with proper cups and saucers, and the cake is delicious. 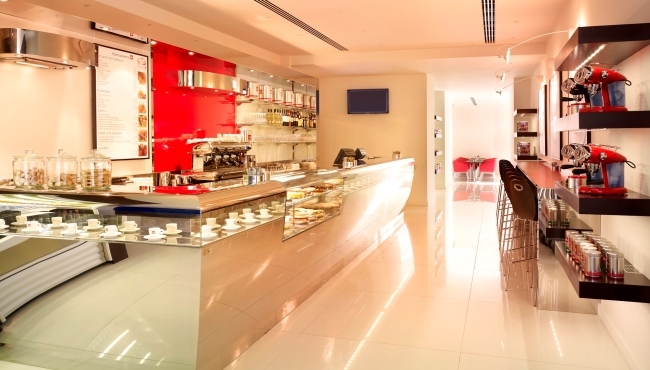 The proposition is simple so far: cake, coffee and croissants; the decor is simple and clean, and the bar is dominated by the large coffee machine and the friendliness of the staff. I hope winter isn’t too hard on them. Artist’s render of Mokoko in Bath. This is where ‘chains’ start, just like Pike Place in Seattle, where Starbucks first proffered coffee and became the business goliath it is today. Same for Costa; everyone starts small, don’t they? 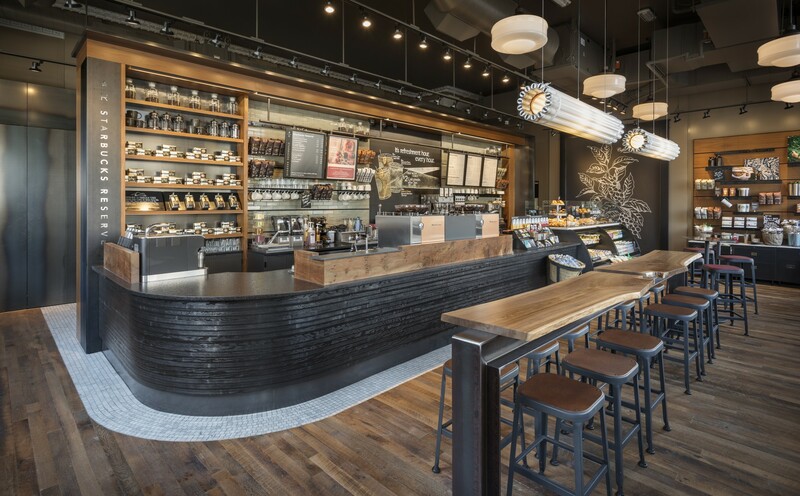 So, let’s take a look at Starbucks’ new stores in its Seattle birthplace, to see how the company is stretching its European design ethos across the US. For example, just a mile away from its original Pike Place Market location is a new store in an old bank building near a college, other restaurants, pubs and boutiques. I’m a sucker for dark, broody design that contrasts textiles such as wood with steel, stone and brick. I find it warm and inviting, and would much rather spend time working in a place like this, or entertaining friends, or simply enjoying some solitude. Seattle Broadway Pike Interior shot of the new Starbucks. Photo by Starbucks. The University Village outdoor shopping mall near the University of Washington is the location for a new Starbucks Reserve. (Did you see my video of the Starbucks Reserve in Amsterdam, where the barista Evert demonstrated the Clover Brewing System?) The ethos here is to tell the ‘coffee story’: Angled mirrors behind the bar bring light into the space and allow customers to watch as baristas create their beverages. Rich displays of coffee artefacts invite discovery and hand-stitched printed maps connect customers to the farms around the world that grow Starbucks coffee. 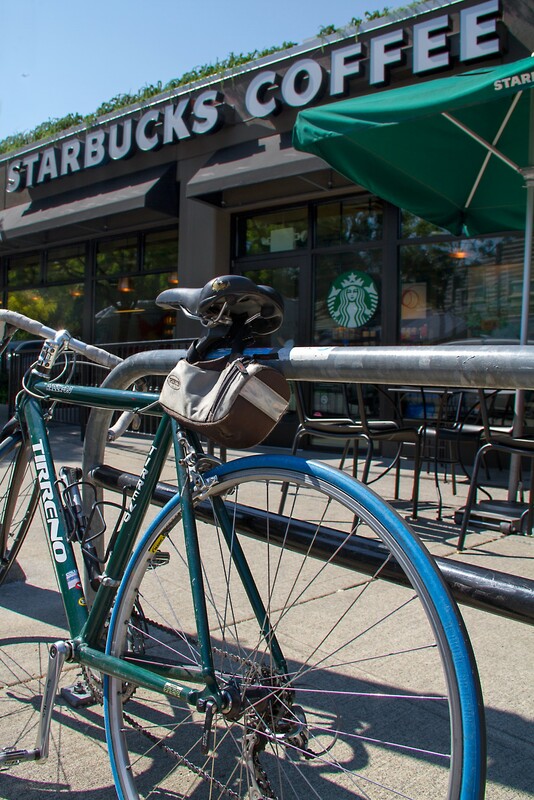 Leschi Starbucks branch in Seattle, with bike theme. Photo by Starbucks. In Leschi, five miles south of the last location, Starbucks’ Seattle heritage takes yet another design turn in celebrating the community’s tradition of cycling, with a wall of upcycled bicycle tubes. This is as individual and thoughtful a space as you can get from such a massive brand, and I like it. It demonstrates that corporate brands can be just as thoughtful as independents when it comes to embracing a community ‘look and feel’, and I think it’s this strategy that will help the giants of the high street stay competitive. What designs are you seeing in your new coffee shops, cafes and fast food restaurants in your hometown? Let me know by leaving a comment below, wherever you happen to live. One of my pet hates is when people converge on a target, such as a corporate coffee shop, and lambast it as being akin to worshipping the devil for no good reason other than its success. I cite Starbucks here, which may be a controversial choice given its recent headlines in the UK for tax shenanigans, but it’s also a fair example of a company large enough to have become a target for simply being ‘big’. This is despite quality assurances, passion for its products and using its money to move coffee trends in the right direction. I’m a fan of ‘local’ and ‘independent’ if the local, independent outlets get it right and don’t try to rip me off. They often get it wrong because there’s a lack of training for baristas, and they charge way too much for a simple cappuccino (which usually comes out as a flat white). I was in Amsterdam recently and made my way to the Starbucks concept store at Rembrandt Square. It’s a fantastic place to chill out and learn a little more about where your coffee comes from via tasting sessions and a ‘Reserve Bar’. It’s an artfully presented, yet casual setting for being by yourself or being social, decorated with a nod to its cultural surroundings and kitted out with some interesting furniture and coffee gadgets. At this particular branch is a Clover coffee system, created by MIT and handled expertly by master barista Evert. He showed the machine at work and we got to taste the coffee, which was absolutely delicious. I’m all for being critical where criticism is due, but Starbucks tends to still fascinate me where others often beguile. There’s something called a ‘Breakthrough Innovation Group’ at the Pernod Ricard offices, and it has come up with a novel way to enjoy cocktails at home. It’s called Project Gutenberg, which is a prototype that the company says will ‘aim to reinvent the at-home cocktail experience’. Project Guttenberg could enhance your cocktail parties. The idea is that you have a ‘library’ of spirits to hand, complemented by an app for your phone or tablet that demonstrates how to make a multitude of cocktails for family and friends. It’s a bit like Nespresso for spirits drinkers, in that the library is something you stock up via mail order. The app will even tell you when one of your ‘library items’ needs to be replenished (you can’t see through them, you see). I like the idea, and wonder how it’s taken so long to happen. The Nespresso model of mail order coffee not only reinvigorated ‘premium’ coffee marketing, it helped the brand underline years of success in the coffee market and sent a message to the high street that life goes on, in whatever shape or form. See the Project Gutenberg video here. If Project Gutenberg is successful, will Pernod Ricard roll out the home experience onto the high street, where you can grab a quick cocktail in a cafe-style environment while browsing the company’s complete range of spirits? Perhaps not – bars will die hard. But you never know. One thing’s for sure: innovation like this may sound the death knell for the wonky table full of bottles. I wonder what Margot and Jerry would think? Allegra Strategies published a report at the end of last year called Project Café12, which revealed some interesting facts and figures about the UK coffee shop market. I attended The London Coffee Festival in April, which appears to have grown in popularity since its inaugural event in 2011, and this reflects the increasing popularity of coffee across the UK. I like this statistic in particular, because it demonstrates that we often complain about ‘chains’, but still enjoy spending our money there. I remember when Starbucks used to be considered expensive, but I now find that it’s one of the cheapest cups of coffee I can get, with many ‘independent’ outlets charging 50p more for a cappuccino. That’s a significant difference, and am I really drinking a better quality coffee? Of the reasons cited for choosing any particular coffee shop, ‘convenient location’ came out on top, with 33% of us preferring to shop where we drop. The quality of the coffee was secondary to convenience (but only just) on 32%, while ‘habit’ was 6%. The last statistic reveals that we are just as likely to search for new experiences as we are to remain loyal to any one brand. What surprises me is that the most popular coffee choice in the UK is a latte (a whopping 30%), with my favourite cappuccino in second on 19%. I’m glad I was reminded about the presentation slides from Allegra’s lab session at The London Coffee Festival, as it was a good event – very lively and full of excellent food and drink producers. Here’s to another strong summer of coffee – mine’s a cold one. I first met Jim Cregan at Bath Coffee Festival 2011 in a large marquee on what’s affectionately known as ‘The Rec’. 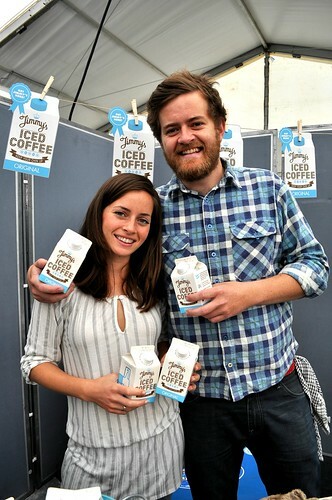 He’s the founder and director of Jimmy’s Iced Coffee, which was launched in April this year at Selfridges in London. Despite our hectic work schedules, we managed to have a Skype chat today and talked about the development of the brand, the hard work that’s going into the marketing strategy and the need for new distribution. You can hear the full audio/podcast interview by clicking the link below. We’re also on iTunes. I enjoyed this year’s Bath Coffee Festival more for the atmosphere than the exhibitors. As usual, some of the big names in coffee were there, such as Lavazza and Taylors of Harrogate, but there was also a sense of fun that seemed missing last year, possibly because of 2010’s wet weather. This time, the balloons were aplenty, the sense of energy was fantastic, and the expanded exhibitor space helped to make the festival ‘buzz’ on a par with some of the excellent coffee samples. Emsal Leo & Chris Steele I met relative newcomers Romwa Coffee quite early in the day, talking to Chris Steele and Emsal Leo about the company’s Thai Arabica coffee, which is cultivated by small communities living close to the Golden Triangle (the borders of Thailand, Laos and Burma), an infamous region known for opium production. The Royal Project Foundation, which was set up by the King of Thailand, has enabled farmers to replace poppies with coffee (and other crops). With Christine Cottrell My long discussion with Christine Cottrell – an Australian teacher who brought her sharp researching skills to the fore in producing the Barista Bible – was enlightening for a number of reasons, not least the fact that her thorough collection of study materials for Barista training is apparently the only collection of its kind. Most of the other coffee aficionados at the festival knew Christine, so her hard work is paying off in terms of networking with the right people. She just needs to secure distribution for her training materials now. Cream Supplies showed off the remarkable Twist espresso maker again (I saw them at The London Coffee Festival not so long ago), and they said it was ‘the last gig on the tour’. Daisy Rollo Martin Blunos provided a cookery demonstration using coffee as an ingredient, while the likes of Daisy Rollo showed the crowds how to make the perfect coffee. I’d enjoyed the privilege of tasting one of her lattes earlier in the day and can confidently say it was the best coffee I’ve had in ages. I didn’t even notice the paper cup. I finally met Jim Cregan, director of Jimmy’s Iced Coffee, who had a great stall and was happily handing out samples with the help of Sophie Willmott. Besides coffee, relatively new products such as OSO Juicy mingled with more established brands such as Yeo Valley, and there were plenty of sweet treats such as fudge and cupcakes to ensure we didn’t overdose on caffeine. Take a look at the Flickr gallery. It’s also on Facebook, YouTube and Vimeo. This is Shaun Weston's blog. Do you still love anyone enough to give them your last Rolo? Should we trust someone who doesn’t eat cake?